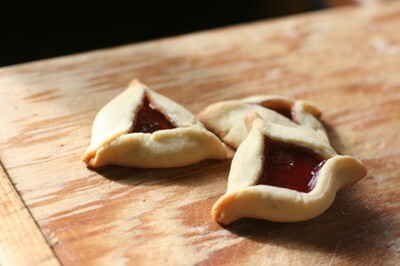 This is a modified version of a Hamantaschen recipe in "A Treasury of Jewish Holiday Baking" by Marcy Goldman. Cream together the butter and sugar, then add the eggs and beat until well blended. Stir in the milk and vanilla. In a separate bowl, whisk together the flour, salt, and baking powder. Fold this dry mixture into the butter and egg mixture until the dough comes together -- I think it looks similar to a pie crust dough. Turn the dough onto a floured board, cover, and allow to rest for at least ten minutes. At this point you can also store the dough, or part of it, in the fridge wrapped in plastic wrap if you want to make the cookies in a day or two. Preheat the oven to 350 degrees and line your baking sheet or sheets with parchment paper. Divide the dough into quarters and work with one quarter at a time. On a floured board, roll the dough out into a circle (I recommend rubbing a little flour on your rolling pin periodically, and also checking underneath the dough or flipping the circle of dough over periodically and re-flouring to be sure it does not stick.) The sheet of dough should be rolled out to a thickness of about 1/8 of an inch. Using a large glass or a circular cookie cutter, cut out rounds of dough and place them on the cookie sheet -- you can place them quite close together. Drop a dollop of strawberry preserves (or the filling of your choice -- I don't think strawberry preserves are traditional but they are easy to use) into the center of each round. Then, use your fingers to fold three sides over, turning the pastry into a little triangle. Pinch the corners a little to close if you are worried about your filling running out. Bake for about 15-20 minutes or until golden brown, turning once for more even baking. Cool before nibbling.